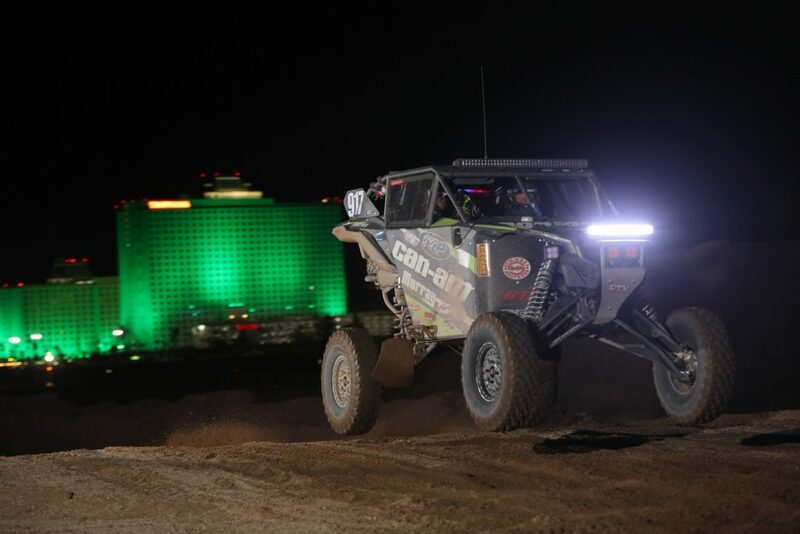 FRANKLIN, Tenn., Oct. 25, 2018 — ITP off-road racer Justin Lambert earned a solid runner-up finish at the Best In The Desert Laughlin Desert Classic, while the ITP-sponsored Murray Racing Team notched a fourth place finish racing on the all-new eight-ply ITP Coyote tires. The No. 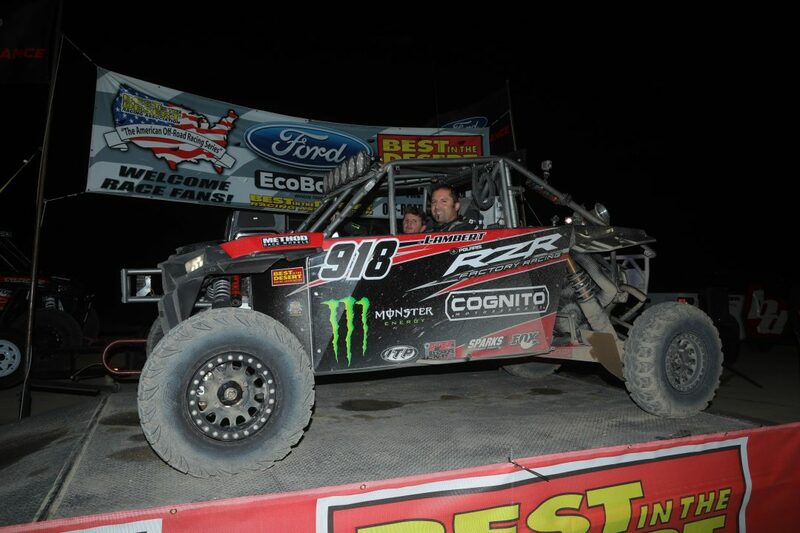 918 Cognito Motorsports / Polaris RZR Turbo of Justin Lambert, wearing 32-inch ITP Ultra Cross R Spec tires, captured second in the UTV Turbo ranks at the BITD Laughlin Desert Challenge event. Justin Lambert (Cognito Motorsports / Monster Energy / Polaris) earned his trip the podium with a hard-fought second-place finish in his No. 918 RZR Turbo. Despite a broken axle during the race, Lambert, who won the BITD Mint 400 earlier this year, was able to recover and gain some valuable points in the process. His runner-up finish gave him 114 points for the round, which allowed him to climb into sole possession of fourth place in the standings and within striking distance of third place. Derek and Jason Murray (Can-Am / ITP / Murray Racing) battled with Lambert and several other UTV Turbo and Unlimited class pilots during the desert night race. ( This was the first BITD competition held completely in the dark.) Hoping to rebound after a tough Vegas-to-Reno event, the Murrays’ outfitted their race vehicle with ITP’s new 8-ply, vehicle-specific Coyote tires. Manufactured in Clinton, Tenn., the radial performance tire is purpose-built for high-horsepower side-by-sides and is compliant with DOT test standards. The Murray’s chose the tire, they said, based on its capabilities in rough, hard-pack, gravel and sandy terrain. The Can-Am / ITP / Murray Racing tandem of brothers Derek and Jason Murray were fourth in the UTV Turbo ranks at the Laughlin race, using the new 8-ply ITP Coyote tires that are purpose built for SxS vehicles. “ITP’s 32×15 Coyote tires hooked up phenomenally well in the Nevada desert,” said Jason Murray. “The flatter profile of the Coyote allowed us to ‘crush it’ over soft as well as hard terrain and pull ahead of the 40 plus competitors in our class.” Added Jason’s brother, Derek, “ITP continues to impress us with the strength and reliability of their tires. Their Ultra Cross tires have been a huge part of our racing success. Now we’re excited to add the ITP Coyote 32 to our arsenal of tire choices.” The brothers finished the race with a time of 02:35:29.9 to earn fourth overall and climb into sixth place in the class standing. Jacob Carver, who finished two spots behind the Murrays, finished sixth in the UTV Turbo class. He ran 32-inch ITP Ultra Cross R Spec tires on his Polaris RZR to score another solid top-10 finish and help him maintain his third-place position in the current UTV Turbo class standings. Currently, Carver is just 44 points behind the class leader and seven behind the second-place position in the class points standings with one round remaining in 2018. Jacob Carver, who finished two spots behind the Murrays, finished sixth in the UTV Turbo class. 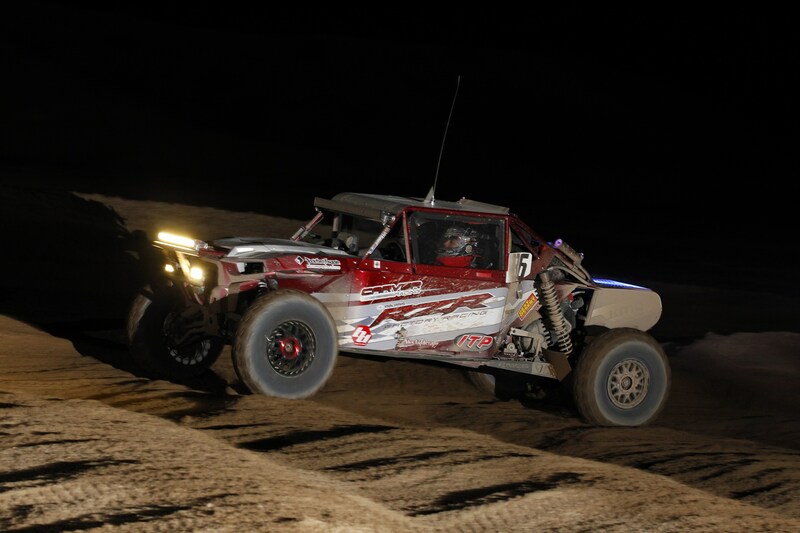 He ran 32-inch ITP Ultra Cross R Spec tires on his Polaris RZR to score another solid top-10 finish and help him maintain his third-place position in the current UTV Turbo class standings. Currently, Carver is just 44 points behind the class leader and seven behind the second-place position in the class points standings with one round remaining in 2018. 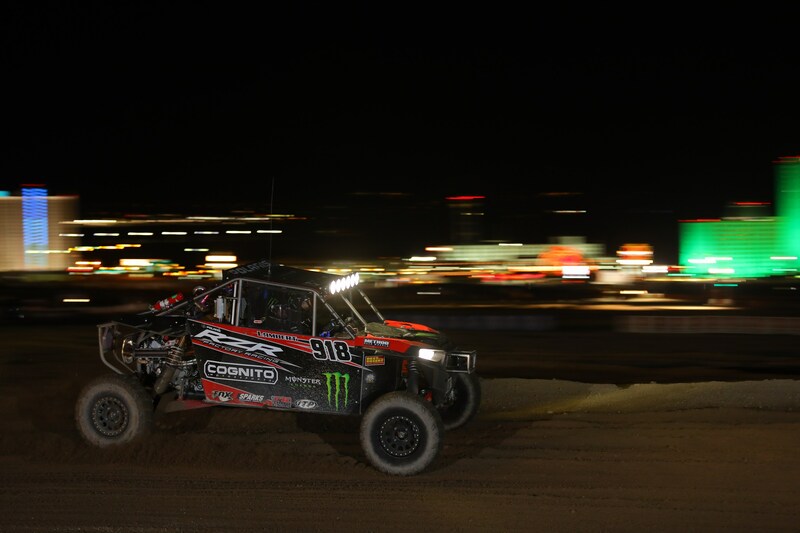 ITP racer and 2018 King of the Hammers winner Mitch Guthrie Jr., also had a respectable event in Nevada, earning 10th place in the UTV Turbo class. Guthrie gained more points than six of the racers currently ahead of him in the BITD class standings and looks to fully regain his form in December at the series finale. ITP racers will next compete in the SCORE International Baja 1000 in Mexico, prior to wrapping up the BITD season the first week of December at the Pahrump Nugget 250 in Pahrump, Nev. The Carlstar Group is headquartered in Franklin, Tennessee and is a global manufacturer of original equipment and aftermarket specialty tires and wheels for the agriculture, construction, outdoor power equipment, powersports, high speed trailer and manual markets. The diverse portfolio of solutions are offered under several leading brands including Carlisle® tires and wheels, ITP® tires and wheels, as well as Cragar®, Black Rock® and Unique® wheels and Marastar® flat free and manual tires.